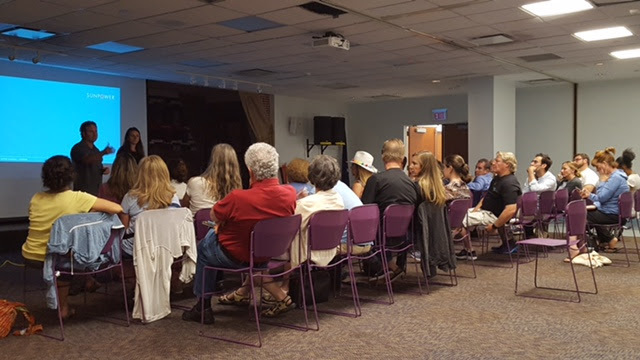 The meeting of the Long Island Community Solar Working Group was held on Monday September 18th 2 pm at the Sustainability Institute at Molloy College. 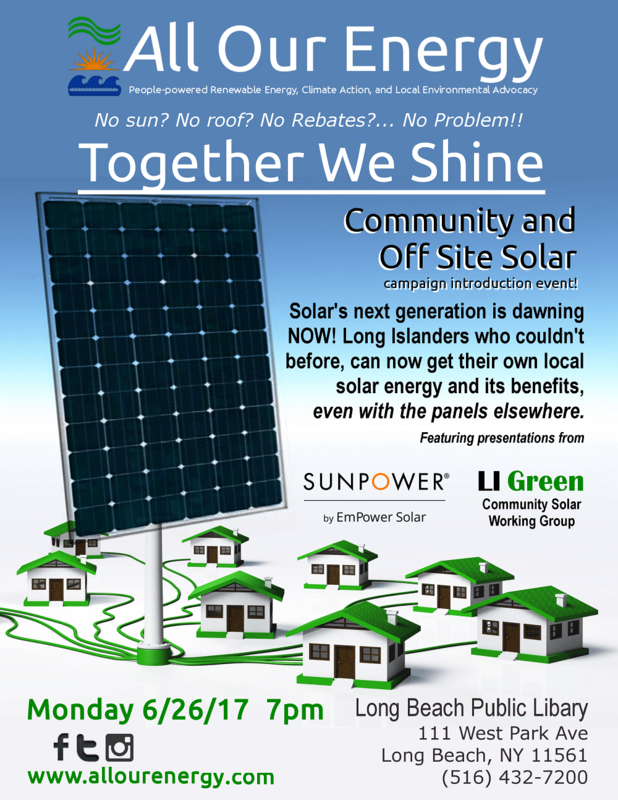 LI Community Solar is a project of Green Long Island, Inc., a LI based not-for-profit community development organization focused that provides innovative region wide energy and environmental programs. At this time over 5000 Long Island families have received Green Long Island services. Thanks to all who came out for our community solar campaign kickoff. We thank the officials who came, representing 4 levels of government and Fios1 had a report on the event. Right now, we are looking for community solar subscribers and for locations to host a project. Bold ideas are welcome and its going to take speaking to hundreds of people-maybe thousands, but we are committed to making this a reality. Help us unlock the future! No sun? No roof? No Rebates?… No Problem!! Can we build a community solar project? Can we put together people who couldn’t otherwise get solar, with their own solar panels somewhere else? We’re going to find out and do it! In light of inaction to address climate change, and with the local change to off shore wind 7-10 years away, all of us must act together now to displace fossil fuels’ pollution, clean our communities, and spearhead the coming renewable energy economy that benefits everyone. Tonight, we put the power of solar in everyone’s hands! 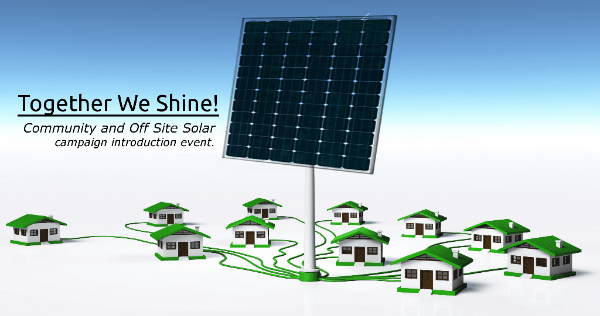 off site / shared solar is here! For the first time on Long Island, residents, businesses, organizations and others don’t need a roof, sun, or tax incentives to make their own low cost solar energy. Find out how it will work, how we can come together and put the power of the sun in everyone’s hands. Yes, we can get 100% renewable energy for 100% of the people- join us at tonight’s debut event. Join us tonight 6/26/17 @ 7pm at Long Beach Library. Presentation by Tara Bono of Sunpower by Empower Solar. All Our Energy’s bold concept to break down even more barriers so you can expand solar. yes- get me solar now! Right now, millions in New York can not make their own clean energy because the sun doesn’t shine on their roof the right way, or maybe they don’t even have a roof! Why should that be our limit? What if we found a way for them to still generate their own solar power that they could use anyway? At our 2/17/16 meeting, we discussed these issues and what we can all do about it. Two ways to do this are community owned solar projects and off site / virtual net metering. Your clean energy is created somewhere besides your house or business, and you still get to use it. These are new strategies that would help unleash a renewables revolution in New York. We have the power right now, in New York and especially on Long Island, to beneficially replace outdated fossil fuel infrastructure that has outlived its expected life span. It must be replaced soon. With your help, we will make sure Long Island moves into renewable energy. If we buy in to all new fossil fuels, we will have them for 30-50 years more without the opportunity to switch to large scale renewables, like off shore wind which are safer and cleaner than fossil fuels, and are ready to go today at the same price as new fossil fuel plants. Inertia, powerful interests, utility profit models that increase based on burning more fuels instead of supplying energy, exclusion of others to supply energy even if safe, practical and economical (not a free market). These modes are outdated and these entities need to move into the 21st century profit model that simultaneously cleans up most of their dirty emissions, or make way for those that will. Join our meeting to discuss putting the “power” in your hands to tell officials and other decision-makers to do the right thing and adopt economical renewables on a grand scale in New York, make community-owned projects easier, and help open new paths for renewables to fill our electricity needs. An exciting time and I’m glad you’re taking this journey with us!